WHEN ARE BUMBLE BEES ACTIVE? Bumblebees are yellow and black, quite “hairy” and commonly seen throughout the spring and summer months. Most people are afraid of bumblebees since they sting. But if you leave them alone, they’ll generally leave you alone too. 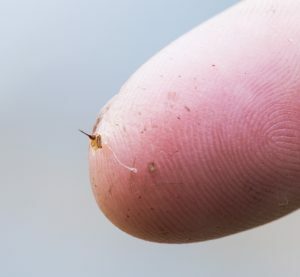 That being said, when bumblebees nest in the yard where children and pets are active, conflict is sure to arise eventually leading to someone getting stung. This article will detail all you need to know about bumblebees so if you have unwanted activity or nests on your property, you’ll learn how to manage the issue and get rid of the threat. Bumblebees are the most popular picture young children will draw when asked to create a picture of a bee. Although everyone likes honey bees, bumblebees are more recognized and accepted. Bumblebees are pretty, their strength is legendary and the sight of them foraging for pollen on flowers is synonymous with spring and summer. So popular are bumblebees that we make our own BUMBLE BEE HOUSES so people can provide housing for them to keep them active in their garden. Our house is 13″ long, 6″ wide and 6″ deep. Pictured to the right is our house with the top off so you can see inside the living chamber. Pictured below is our house with the top secured and ready to be set afield. Keep these in well protected areas around decks or under sheds if you want to keep bumblebees around but not have them nesting in your gardens. Bumblebees are those hairy yellow and black bees generally seen flying in and around flowers. Bumblebees are a true wonder of nature. 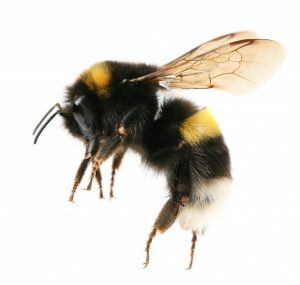 How they are able to fly has always been a mystery to engineers that have long maintained the design and structure of bumblebees is defying the laws of physics every time they take to the air. Bumblebees are naturally heavy and sometimes loaded with pollen to such a degree that flying can be difficult. But every year they do it better than any other flying insect and this accomplishment is what makes them so unique. Bumblebees are one of many flying insects that contribute to the pollination of plants and flowers. When people think of pollinators, they typically think of honey bees. But bumblebees along with a wide range of wasps, beetles and even ants all serve as pollinators too. 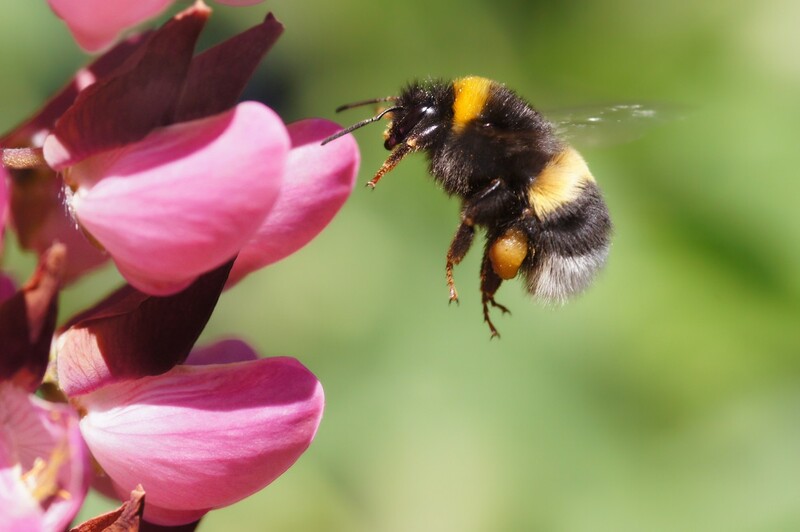 Bumblebees are most active in the morning and mid day. Queens will emerge in early spring as outside temps warm. These fertile females are usually eager to lay eggs so they’ll begin straight away looking for a nest sight. In fact queens have been ready for this moment since the following year. If she chooses the right sight, her eggs will prosper. Within two months, the nest will be an active population of 75-150 bees or more. All members of the nest will be actively contributing to their community. Some seek food, some tend to offspring and others will guard and fix the nest. Bumblebee adults will be the traditional yellow and black, about 1/2 to 3/4’s of an inch long and seemingly “hairy”. We often get asked how to tell a bumble bee from a CARPENTER BEE and the general difference is that carpenter bees will be larger. That being said, the easiest way to tell the two apart is to look at the abdomen. Carpenter bees have shiny, metallic looking abdomens and bumble bees are hairy from the tip of their nose to the end of the stinger. Bumblebees can become a threat because they sting. Bumblebee stingers will deliver a potent poison which is sure to irritate most people. In some cases, people can develop severe allergic reactions including swelling, cramping, respiratory congestion, nausea and temporary blindness. In general, it is best to watch but not irritate foraging bees you see in the yard. Remember, bumblebees don’t want to fight; they are merely gathering food and going about their day to day responsibilities when you see them. Avoiding direct contact is usually easy, but sometimes conflict is inevitable. Problems arise when bumblebees nests in close proximity to where we like to picnic, work or play. When nests are around active people, someone is sure to get stung. As mentioned above, working bumblebees will be indifferent to you. They have a job to do and don’t have time to waste chasing every person or animal that gets close. However, that same bee will be completely different if you come close to it’s nest. Bumblebees like to nest under flat objects and they will aggressively protect their community. They like to feel something on top and underneath them as they nest. This leads them to locations under boxes, under low profile decks, under rocks, under wood chips or pine straw, between wood logs of a wood pile or landscape timbers, under a patio slab, under a tarp or even under thick sod like Zoysia. The most common way people find a nest is by accident. The usual way is when yard work is being done involving massive cleanup. During this process, something gets moved and a nest is uncovered leading to a flurry of stings. Although nests are abandoned every year, it is common for a new nest to start close if not exactly in the same location as a nest the preceding year. Bumblebees are opportunistic and seem wired like gps to find these same locations year after year. Long story short, if you give them the chance to have a great nest sight in your yard, they will take it. To prevent this pattern from repeating, remove as many likely nest locations you can find. But if you already have a nest, you will have to do some pest control to get your property back from these territorial bees. Once an active nest is identified, be sure to keep children and pets away from the area. Bumblebees may die after stinging, but they are not afraid of this consequence. And though passive when away foraging for food, bumblebees are a different “animal” when you get close to their private “nest” space. If you do it by accident, they don’t care. Hopefully you’ll realize what is happening before you get stung. In general, they are easy to see once 5-10 get active so you can’t miss them like a swarm of yellow jackets which move faster and are 1/3 as big. Once a bumblebee nest is discovered in the yard, there are three ways to treat. The best product to use will depend largely on where they’re nestled. Most people want to spray them with a “wasp freeze” type aerosol but these formulations are not well suited for most any bumblebee nest. The best options are generally either a dust or a special concentrate we carry which is “non repellent”. Details on all three are explained below. As stated above, most people naturally grab a can of wasp freeze and hope if they saturate the ground where the bumblebees are nesting, they can kill off the entire next in a few seconds. This rarely works. Yes, most wasp freezes will kill bees you hit directly with the spray. But remember, they’re nesting under something. And if this “something” is a tarp, wood, plastic or something non-porous, no aerosol will kill the whole nest. Now if they’re under grass clippings or piled up thatch, you might stand a chance with our penetrating BEE FREEZE. This formulation is very different from most in that it features a solvent system which allows it to soak through porous grass and thatch. So yeah, it will kill active adults when you spray. But like any other wasp freeze, it cannot kill eggs or developing pupae. So even though you might be able to stop all the active adults, there is a good chance the nest will “rebound” in a few weeks following your treatment. That’s because any aerosol will dissipate and evaporate leaving no residual. And without a residual in place, hatching eggs and pupae will have free roam to grow and eventually bring the nest back. So why would you even use this formulation? Well, it can be handy in a pinch. Like if you’re working in a yard and are unsure where the nest is but keep encountering a few rogue bees. 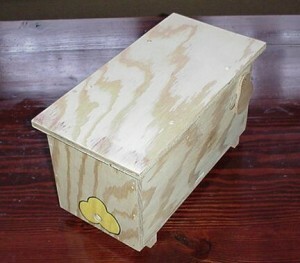 Or if you get lucky and discover a nest that’s well contained and easy to access. No doubt directly spraying it with this formulation could solve the problem for good. But in general, you’ll be much better served using either the dust or the liquid listed below. For most bumblebee nests, dusting will usually be the most direct and quick fix. So if you know where a nest is located, using DELTAMETHRIN DUST will both kill all stages active and provide long lasting residual so the nest cannot rebound. Deltamethrin dust is moisture tolerant so once applied under a shed, rock or log, it will lay on the dirt for many months. This way when eggs hatch, they too will die. Deltamethrin dust is similar to baby or talc powder in consistency so its light enough to be “blown” out 5-10 feet yet heavy enough to stay where you direct the flow. Deltamathrin dust goes a long way too. One pound will cover up to 500 sq/ft of turf so you will have plenty to use on several nests is you have a bad problem in the yard. Plan on dusting the nest in the evening, right at dark, when all the bees will be back in their nest. Direct the dust into their nest opening by shooting 5-10 heavy squirts of dust and then leave the area. By the next morning, the nest will be shut down with the only visible trace being a few dead bees. In most cases, they never get a chance to even leave the nest once they get covered in the dust. To apply the dust, you’ll need a good HAND DUSTER. Our model comes with a 6″ extension standard but is also available with a 12″ extension. Just remove the cap, fill it 1/2 to 2/3’rds of the way up, seal it back up and go afield armed and ready to take out any bumblebee nest. The whole process of dusting the nest should only take 10-15 seconds. If done properly, the dust will float back to key egg chambers, nurse stations and even the queens den. And it will kill all of them quickly. In fact most will die before they can ever emerge. The last way to treat a bumblebee nest is when you’re not quite sure where the nest is located. In other words, you know the general area and you even see bees coming and going. But you’ve not been able to locate their entry/exit hole so dusting wouldn’t be productive. For these situations, your best option is to use our unique “non repellent” spray. This method is ideal for when the nest is well hidden or for when the exact location is hard to reach. For this scenario, your best option is to saturate the area with OPTIGARD. Optigard doesn’t kill quickly. In fact it will take a good 3-4 days for it to work. But this is very much by design. Mix 1/2 oz to a gallon of water and then spray the mixture over the entire area you suspect they’re nesting. You don’t have to be exact. 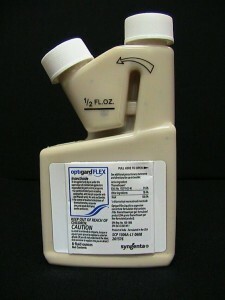 But plan on spraying a full gallon of mixed product for every 100 sq/ft (10 ft by 10 ft). Do the treatment in the evening, just before dusk, and renew it three nights in a row. By the 3rd to 4th night, you will notice most if not all bees are gone. And since Optigard provides a residual that will last 2-3 months, hatching eggs and pupae will succumb to the treatment too so the nest has no chance to “come back”. Optigard is odorless and safe enough to spray on trees, bushes, flowers and the ground around all plants. 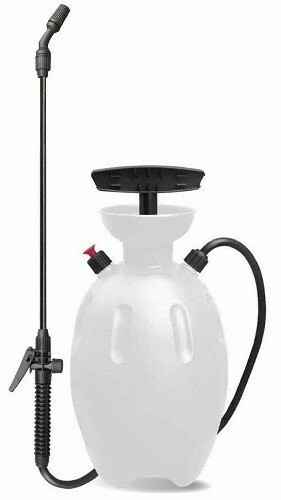 To make the treatment, you’ll need a good PUMP SPRAYER. And you’ll want to make sure you get it all applied. The good news is Optigard won’t bother the bees. Even as you spray them. To them, its just like water so they’ll think nothing odd is happening but maybe a little rain shower. Bumblebees are no doubt a “good” bee and one of the many wonders of nature. However, their nests can make our yards a scary place for children and adults alike. Use Deltamethrin Dust to treat nests when you are certain of their location. When the exact location is unclear, go with Optigard instead and “broadcast” it over a large area. Either option will control an active nest and help prevent people from accidentally getting stung. My mother says bumblebees are killing her roses. My mother has had roses for years and I don’t doubt her although I cannot find anything about this happening on the net. Is this possible and if so how can she get rid of them? There are many types of bees and wasps that will target certain plants under certain conditions. And though it’s not likely to be a bumble bee, it could be another type of bee that looks like bumble bees. Regardless of which species it turns out to be, there are two options that can be used to stop any destructive activity that might be injuring her roses. The first is to spray the plants with Bifen. This water based concentrate is gentle enough to be used on any plant without concern that the treatment might somehow hurt it. It’s odorless and gentle and any pest willing to land on treated surfaces will die within a few days of the treatment. That being said, most flying pests like bees and wasps will detect it’s presence and avoid the plant. Now if she prefers to spray nothing but a repellent, NBS is an organic insect repellent that can be added to water and sprayed on plants, homes, etc. with the goal being to repel unwanted insect activity. It won’t kill or hurt any insect but like the Bifen, insects can detect it’s presence and will stay off where it’s been applied. We have a 3 and 8 yr old and a wife that is deathly—literally—allergic to any stinging insect. I can’t find a nesting source. They just fly around wild weed flowers in the yard. What is the best and most effective method of treatment? Broadcast spray the entire yard with Cyonara RTS. It’s labeled for use on lawns, shrubbery, etc. and will both kill and repel flying insect pests. Treatments should last 1-2 weeks and won’t pose a hazard to the family or the plants. My mother is 90 years old and has a ramp in her carport. Bumble bees have bore holes and swarm around the door. I am afraid they will sting her. They also swarm around the patio where she sits daily in the sun. How can I get rid of them? I cant find a nest, only holes. What you’re describing sounds like Carpenter Bees and not Bumble Bees. Carpenter bees actually bore holes into wood and in fact, these holes serve as their nest. I have a bumblebee nest in my backhoe. I cannot see the nest but think they are in the frame. I have sprayed bee spray into where I can reach, but they are still there.They are angry as soon as I try to use the machine and I’ve been stung six times. What is the best way to rid these bees in this situation that will not harm my chickens and dogs that I have running in the yard? Or do I just wait for winter? As you have no doubt learned, these bees will avoid the treatment you apply. Basically bees are sensitive to most any traditional pesticide and once they know it’s present, they’ll stay off the spray and not move over the chemical because they know its there. This in turn means they’ll keep being active the rest of this year. Additionally, its highly likely they’ll return next spring or summer to the same spot because the overwintering queen will be “programmed” to use the same area where her previous nest was successful. For this reason it would be best to take care of the problem now. Fortunately we have the answer. So for cases like this, we have a new type of product that works well. It uses a new type of active which insects cannot detect. So if you were to saturate the area where you see the bees active with a good 1 gallon of this product (mixed with water), you’ll knock the nest out for good. This will happen because unlike traditional chemicals, the bees cannot detect this new active ingredient. So after you spray, they’ll go about their business of landing in the area, walking over the treatment, etc. and basically not realizing their picking up a lethal dose of the chemical that will very soon kill them and the rest of the colony. Now the way this product works is slow. This means it won’t do anything for 2-3 days. But during this time, any bee that touches a treated area will pass some of the chemical onto other members. So when it does start to work, it will be after many bees have touched the active. And since so many will have come in contact with the spray, it means they’ll all die. Now this might take 5-7 days for the nest to eventually shut down but it will happen. I have a nest of bumble bees under a crack in my foundation steps leading to the front door of my house. I think they may be in between the foundation and the sill of the house. They have to go! Question is once the I kill them in their nest what happens to their dead bodies? Will it create a health hazard rooting away in the wall? If they are in fact bumble bees, there will be no odor associated with treating their nest and the subsequent recycling of their bodies. No doubt honey bees can have lingering odors after treating because honey bee nests will number in the hundreds if not the thousands. Add to this the fact that most honey bee nests include honey and its easy to understand why their nests can smell like something rotting for months after a treatment. But bumble bees will only have 20-40 active bees and no honey so even if you kill them all at night while they’re in their nest, you won’t detect any odor from their remains. On a side note, the Deltamethrin Dust listed above would be a great way to treat this problem. Using a Hand Duster to apply it, you should be able to treat directly into the crack they’re using and with 5-10 heavy “puffs” of the duster, get the job done. The dust will basically flow deep into the recess void they’re using and in doing so, provide quick results. IF you treat in the evening, around dusk, you should see a huge reduction in activity by the next morning and within 2-3 days, the nest should be shut down. We had bumble bees in our loft last year. Council would not remove them. In the winter we destroyed the nest and got rid of the loft insulation and put new down and more boarding. I heard buzzing above my head in the bedroom at the front of the house. We now have seen bees going in the other side of the house last week near the loft hatch and we need to go into the loft within the next week. I am at my wits end, scared of bees and afraid they will come into the house! Help! Now bumble bees will do the same thing too and if they find a good location to build a nest, they’ll mark it as such. This means from year to year they can use the same area unless you treat it using one of the treatment options listed above. So even if you get rid of insulation, their nest and replaced the boarding, you’d be silly to not treat with some Deltamethrin dust to insure they won’t come back and use the same area again. So at this point I suggest you treat the area with the dust to both kill and prevent new nesting. 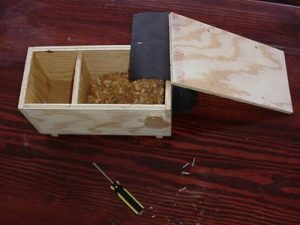 But if it turns out to be carpenter bees, you’ll need to use Drione dust (which is listed in the carpenter bee article). This dust is different from Deltamethrin dust and requires a more specific application. Basically you must treat their nests directly and you’ll only be able to learn of such nests once you get into the loft and see if any exist. But if its definitely bumble bees and you decide you need to dust the entire loft, use a Dustin Mizer. Bumblebees… Every time I go into the barn 1 or 2 bumblebees get very aggressive and I have been stung. I figure there is a nest but there is no way to tell where as I have moved here to my mothers farm only a few months ago to help and the barn has several old pallets on the dirt floor with many buckets and boxes of “junk” and “stuff”. I can’t even get near it to look for a nest as the bees come after me as soon as I walk in. But there are 2 barn cats that are great at keeping mice out and I don’t want to do them any harm so what can I use on the bees? Without knowing where the nest is, treatment will be tough to do efficiently. But there is an option. We sell a “non repellent” concentrate. Its fine to use where people, pets and other animals walk or live. Using a hose end sprayer, you could broadcast it over all the hay, pallets etc. and let the treatment do its thing. Just keep the cats away during the treatment but once it dries (which will take 1-2 hours), they can come back with no hazard present. So whats special about this product? Well, the active is not detectable by insects so they’ll readily walk or crawl over it. And it won’t kill them quickly. Basically what will happen (assuming you get enough applied so its on top of where they’re nesting) is that as they forage in and out of their nest during the day, they’ll be touching some of the hay and/or dirt that’s been treated. This will in turn cause them to pick up some of the active. The active will then be transferred to other members of the nest since bees are highly social. This will happen for 2-3 days and then by the 4-5 day, the active will “turn on” and when it does, kill all which came in contact with the chemical. 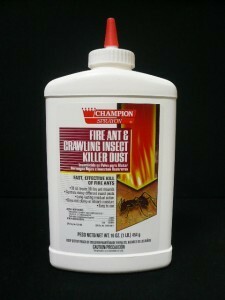 This product is highly active on social insects like bees, ants and termites. And it doesn’t have to be applied directly to their nest. So if you can narrow the area down to say 25 feet by 25 feet, you could easily apply gallons of mixed material and get the job done. 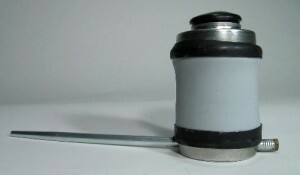 Commonly used on foundations, plants, shrubbery and in the ground, its easy to use too with any good hose end sprayer.